The Town and Gown Players are performing a musical revue based on several works of Shakespeare this weekend. 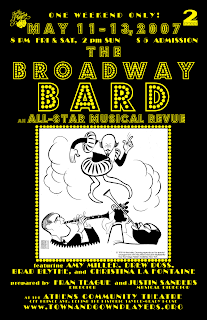 "The Broadway Bard" has about 30 Broadway tunes that will be sung by Amy Miller, Drew Doss, Christina La Fontaine, and Brad Blythe. This Second Stage production is brought to you by director Fran Teague and musical director Justin Sanders. All tickets are $5 at the door with no reservations required. The show will be at the Athens Community Playhouse on Grady Avenue behind the Taylor-Grady House. Performances are at 8 p.m. today and tomorrow (May 11 and 12) and 2 p.m. on Sunday (May 13). I took my mother to the show on Mother's Day. Good stuff! I am looking forward to the next installments of the Shakespearen Summer series.